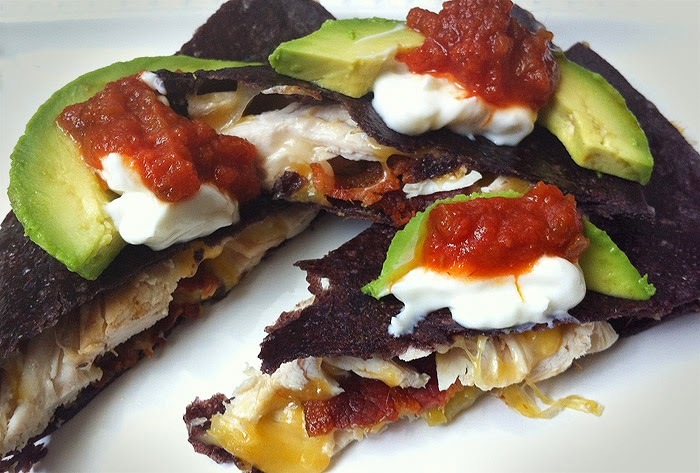 I recently had the opportunity to sample Food for Life’s exotic black rice tortillas. I love traditional flour tortillas but very rarely eat them, as they offer no health benefits. These tortillas are gluten-free and made with health in mind. Black rice is described as a “super grain” full of vitamins, minerals and naturally occurring antioxidants and fiber. They are also 100% vegan and don’t contain any conditioners, additives, artificial flavors, colors or preservatives. I filled these tortillas with cheese, chicken, bacon and green chilies and topped with sliced avocado, sour cream and salsa. The outcome, a delicious quesadilla. Crispy, slightly chewy and the black rice complimented the fillings and toppings just perfectly. One thing to note, these are best served warm or they have a tendency to tear given they are gluten free. You may also consider substituting these tortillas for your next wrap, burrito, Mexican casserole or make homemade tortilla chips! Thanks to Food for Life, my future is going to include more guilt-free quesadillas. Heat olive oil spread evenly in a large frying pan over medium heat. Immediately add tortilla to pan and top with chicken, cheese, bacon slices and spoon green chiles (as desired). Cook until cheese is melted, then using a spatula fold in half and continue to cook for about 30 seconds on each side or until desired crispness is reached. Remove from pan and cut into wedges. Top with sliced avocado, sour cream and salsa. Serve warm.